Here is one extraordinary diamond bracelet for an extraordinary lady. 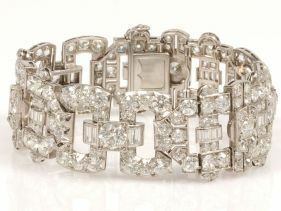 This Ladies Art Deco platinum and diamond bracelet, circa 1925, is a rare and authentic treasure that is currently being auctioned online for $40,000. Offered by Authentic Luxury Goods, this gorgeous antique bracelet from “The Roaring 20’s” is comprised of articulated pave-set diamond links. There are two hundred sixty nine diamonds; two hundred thirty four Old European cut diamonds and thirty-five straight baguette diamonds, for a total diamond weight of approximately thirty-two carats. To learn how you can purchase this fine jewelry from one of history’s most exciting eras, go to its auction page at: Art Deco Jewelry Auction.